A polar bear with three cubs. 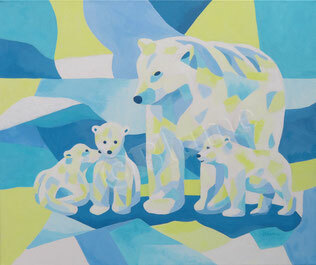 I used blue and white colours for the cold and I used yellow colours as a contrast expressing the warmth and of life and of family bonds that emanates from the family portrait. The composition also underlines the family bonds and the figure constellation with all bears moving towards the center puts togetherness also at the metaphorical center of the painting.